You might be surprised at how often Arizona AC units fail due to ice build-up on the coils. Restricted air flow from dirty or clogged air return filters can cause ice to form on the coils. Once ice begins to form, it will continue to accumulate as long as the cooling system is running. This photograph (taken today) shows just how much ice can build-up and completely restrict air flow! The coils need plenty of free air flow around them to prevent this from happening. The best remedy is to make sure you change all filters regularly. The other culprit for freezing Air Conditioning coils in Arizona is a low refrigerant level. When refrigerant levels are too low, the system has to work harder and stay on longer allowing more time for ice to form. Make sure to have your system checked each year for refrigerant levels and other potential problems. Arizona AC units tend to freeze up more often during the higher humidity levels of the monsoon season. Now is the perfect time for an AC system tune-up! 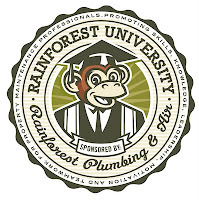 Call Rainforest Plumbing & Air to schedule service today - 602-253-9376. This is a very helping and useful info you have shared here regarding air conditioners, appreciate this work. i once had this problem and it was really very irritating. now i know how it happens. this is what i call a very informative post. I saw many sites but yours is very interesting, you got talent in writing posts, site bookmarked! Waiting for more info!